Looking to clean your pads during or in-between uses? If so, the DI Brushes Foam Pad Cleaning Brush could be exactly what you are looking for! This brush helps safely break up and release excess product that can become trapped in the pad during use. The 8" contoured handle design keeps your hands safely away from the surface of the pad while cleaning. This allows you to comfortably clean your pads in less time. 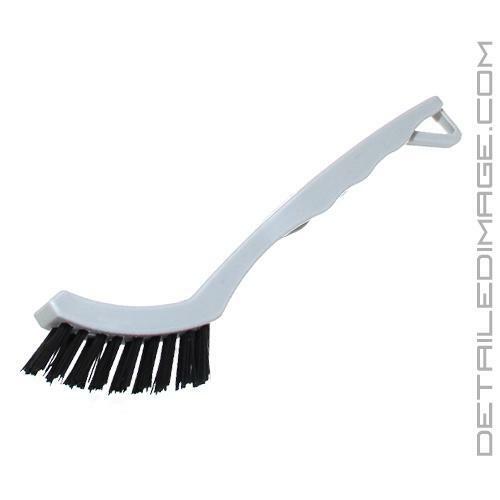 .75" nylon bristles are durable enough to last years, while still being soft enough to clean your pads safely. Use this brush with light pressure in multiple directions to help deep clean your pads. Cleaning your pads with this brush several times during and after your detail will help prolong the life of these pads and continue to keep them in ideal working condition! Here is yet another GREAT brush from DI! This brush gets into tight areas and the stiff bristles work really good on carpet edges. This small brush made it very easy to clean my white foam pad without harming the foam.